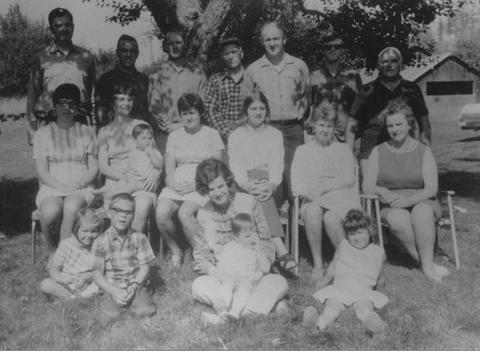 Left to right, back row: Richard Brandt, Bill Davidson, Harry Rae, Bert Rae, Jimmy Rae, ?, ?. Middle row: Mrs Harry Rae, Anne Davidson, Duncan Davidson, Mrs Jimmy Rae, Carla Rae, Jessie Rae, ?. Front row: ?, Kevin Rae, Janey Rae, Annette Rae, Christine Rae.